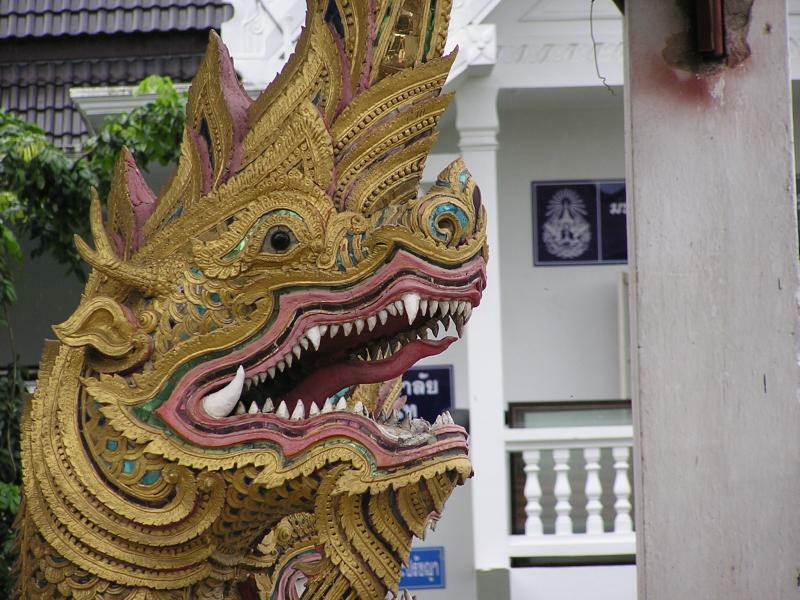 Do you know what the funniest thing about Thailand is? The little differences. I mean they have the same stuff over here as we have over there it is just here it is a little different. 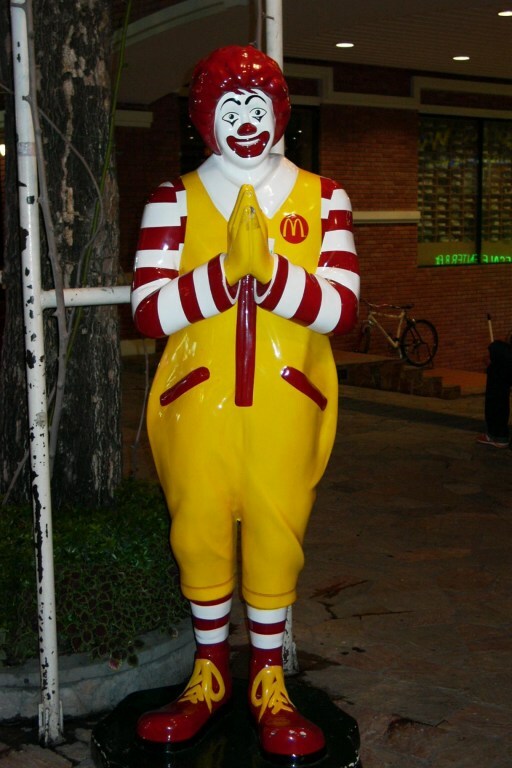 For example at McDonalds in Bangkok you are greeted by Ronald McDonald doing a Wai*. And I don't mean no small wai, I mean a big regular Wai. A quick glance reveals the similarities however. The Thai talk in Finnish and Swedish cell phones; drive Japanese, French and German cars; eat at American fast food places; and buy their snacks at American 7-11. And when in the big cities the wealth seems abundant. Before coming here I had read that the average monthly income in Thailand is 5000 Baht or a little less than $125. The urban Thailand I see have none of the signs of being poor. The cars are nice the people well dressed and the similarities to a western metropol striking. Revelations to the differences started on the way up to Chiang Mai, the first stop on this trip together with Micheleen. Already at the bus station in Bangkok I was introduced to legendary Thai friendliness. Having reached the terminal straight from the airport, it looked more like an angry anthill inscribed with hieroglyphics than a bus station. 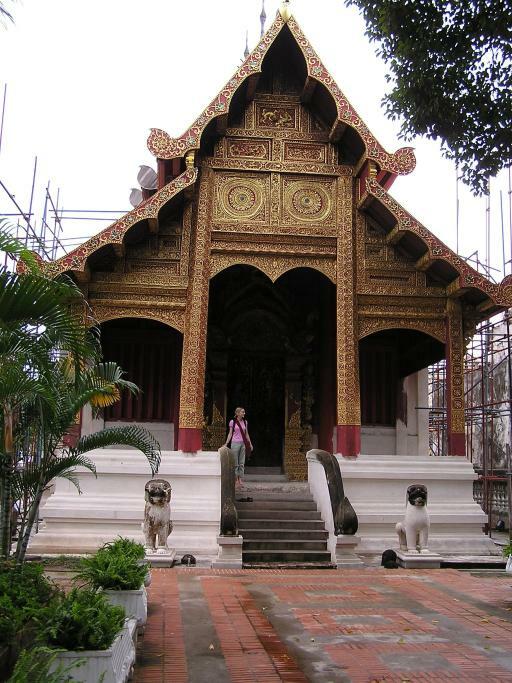 But before the confusion could sink in a Thai who knew little more than a sentence of English asked "Where are going." Which led to a whole hand holding affair that ended up with Micheleen and I on the right bus to Chiang Mai. It is not uncommon to get very much help and always with a big smile. I have yet to feel like an unwanted outsider even though I stick out like a sore thumb at times. Knowing very little about Buddhism I am inclined to attribute this very friendly behavior to their Buddhist beliefs. 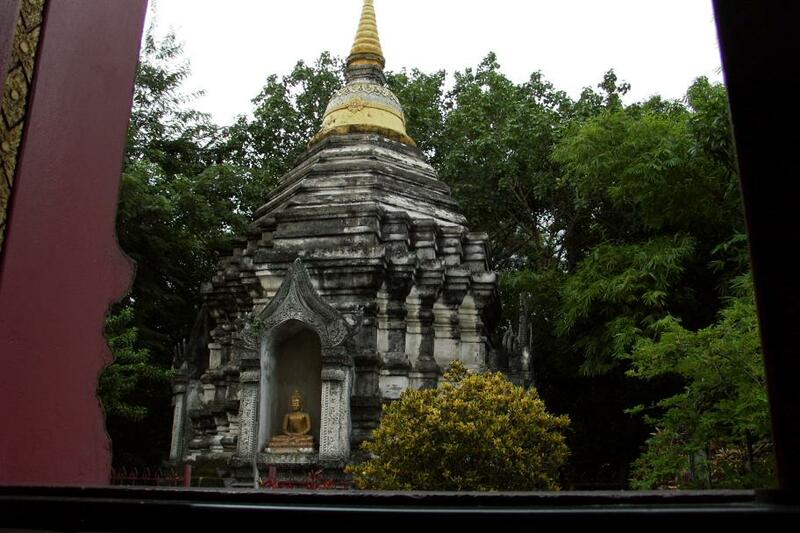 Besides the friendliness and the smiles the Buddhist temples and prayer is very present in society. 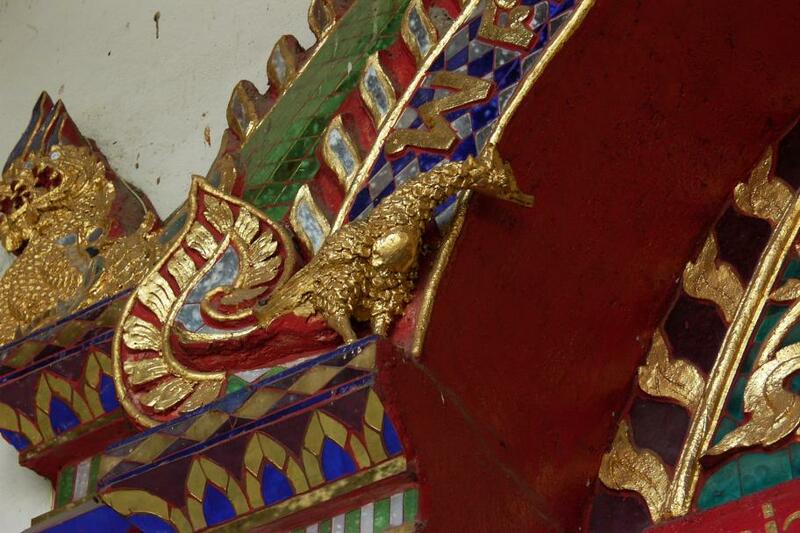 The obvious presence might be exasperated by the colors and decorations of the temples. There might be as as many churches in Europe or more likely the States but the in-your-face-appearance of the Buddhist Temples makes them impossible to miss. (Please look at the pictures for an explanation to what I mean.) Many remind me of the Golden Hall of Rohan or a chinesse new years celebration. After a week of observing Thailand I could summarize my impressions by borrowing a sentence from a Thai climber I meet in met here in Chiang-Mai: "It is same same but different." 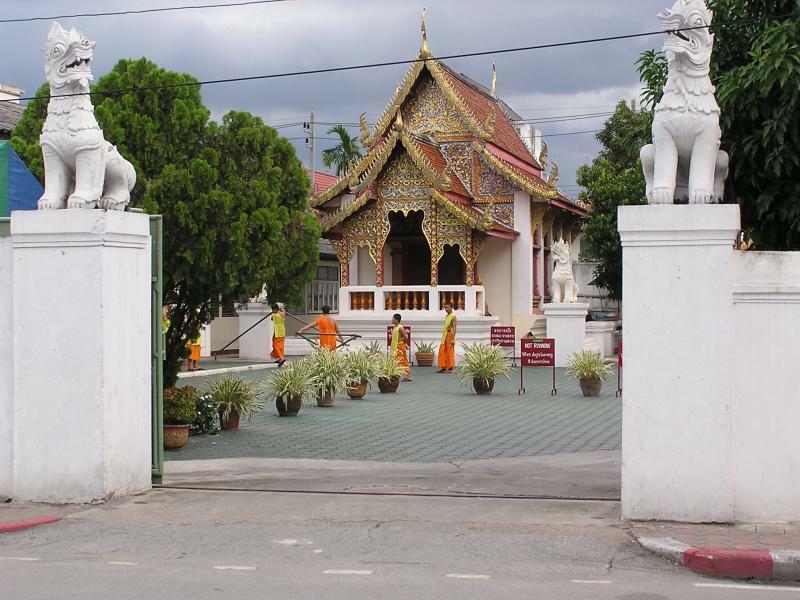 * Thai greeting consisting of hands together in prayer like position. Any culture shock that I might have had is completely gone. I'm even used to people being friendly (and worry about how I will handle regular people again). I don't prepare my defenses when someone approaches with all the visual cues of a hustler anymore. And the bus experiences from the last entry have been experienced many times over. At one point it even became crucial. Eva and I managed to do what I thought was impossible; go to a place that is not mentioned in the back packer bible - the lonely planet. But with the help we ended up going in the right direction and saw the intended temple. 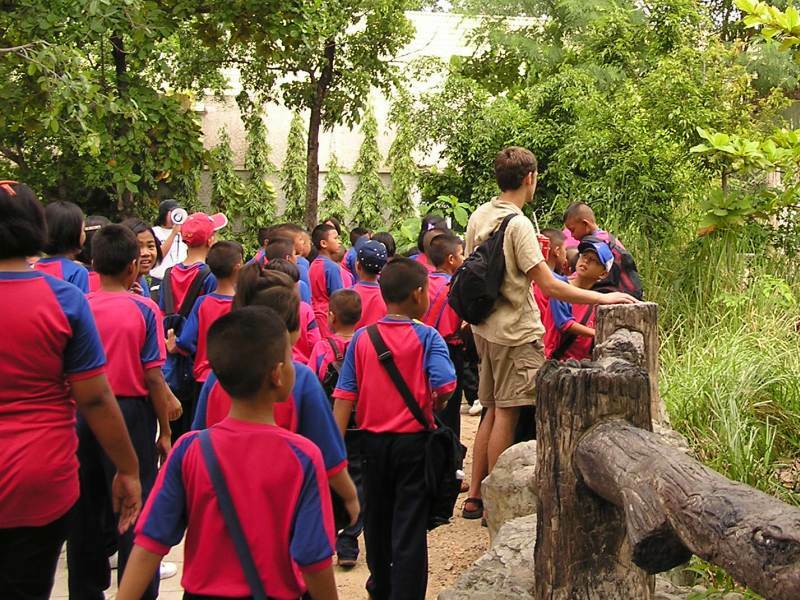 The dream would have been to see a wild tiger or wild elephants when we visited Khao Yai National Park in the North of Thailand. Instead we saw gibbons, monkeys, several great hornbills, a blue scorpion and several other enormous insects. And besides, the wild elephants were making such a ruckus we could feel their presence. So there was little disappointment. Our day started very early when our guide company picked us up at the hotel. After a long drive, in the back of a pickup truck, winding up into Khao Yai (Thai for big mountain) we stopped on the road to put on our anti-leech socks which contrary to the name don't provide much protection. By the end of the day I had two purple suction marks to prove it. Once on the trails the untamed vegetation and the humidity create the appearance of being inside an ancient battle where everything is fighting for the last bit of light and air. The wilderness is complete but the most striking features are the sounds. In the early morning the air is permeated by the singing of gibbons. Our guides managed to locate them after a little chasing. Through the eyepiece of the binoculars they look surprisingly human and their calls make them seem very sad. On the way back to the car we ran into roly-polies that looked like great big chocolate truffles once scared and "longhorn" spiders; Spiders with antlers several times the size of their body. As the day progressed we saw more and more exotic insects, trees that smoother other trees, monkeys with canines the size of 12d nails and as the sun set the sky filled with great hornbills returning home. WOW! The one word summary of climbing in Krabi. WOW! I am very glad that I did some traveling before I came here otherwise I fear I will never have seen anything else of Thailand. Four weeks in one spot and I barely scratched the surface. There is so much to project here and even more to bolt. Miles and miles of underdeveloped limestone. The climbing is centered on the tiny peninsula of Railey but hours before the bus reaches Krabi town, the closest big town to Railey, the cliffs start looming over the roads. One could settle down almost anywhere in this province and not have enough time to develop the climbing in the near vicinity. The climbing on Railey is perfect for anyone liking vertical to extremely overhanging limestone; single pitch hard sport to moderate multipitch; serene nature or post climbing parties. My only regret is that I don't think the pictures does the place justice.